The Pack Mule still looks wonky, but at least is more at home in the outlands. I did a grocery run into town yesterday, a trip taking an hour each way, not including the dawdling and looping around in the store to locate things. I found everything I needed though, and then some. Meat, produce, fruits, eggs, etc. Of course, I needed to replenish my supply of Carlo Rossi’s Paisano Fine Table Wine. I’m not sure what vintage it is, since it’s $13 for a glass 4-liter jug of the stuff. Red wine. Good for the heart, you know, unless of course you drink all of it in just a few sittings. I even found some sunscreen rated at 100, just the thing for if one of the scheduled Bonneville Speedway events isn’t rained out. Unfortunately, they had a sale on Coca-Cola. If you bought six 1-liter bottles, the price dropped to $1 a bottle. I was helpless to resist. In the store, I quickly stumbled into three people wearing “Venturi Buckeye Bullet” T-shirts, who have their racing vehicle parked in one of the hangers of the defunct WWII airport at the fringes of downtown Wendover. They said they were waiting out the weather for a bit to see if an FIA-certified land speed record attempt could/would be made. What’s notable is that their narrow four-wheeler is entirely electric, and in a previous incarnation has topped 320 MPH in the past. They sounded like they were sitting on an updated design, and had their hearts set on 400 MPH. These guys (and gal) are obviously packing some serious watts. Personally, I am very optimistic for electric-powered vehicles in this setting, since short bursts of extreme power levels is their forte, much more so than long-distance runs. By the way, they mentioned the special race events for electric motorcycles at the Isle of Mann, so they apparently get around. This is an interesting place, come August! 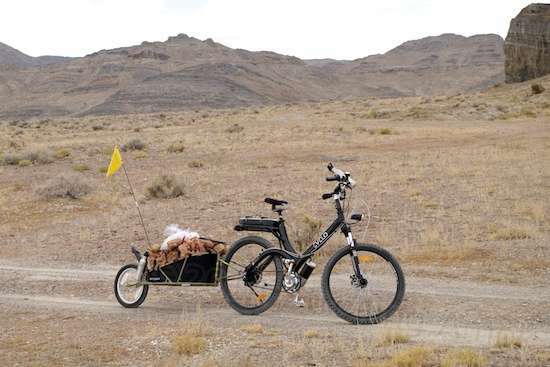 Once I was back out in the hard reality of the parking lot with my e-bike and trailer, it became apparent that I’d completely forgotten about owning a rear rack and basket upon leaving the campsite. Oops. Oh well, no turning back now! At least I remembered to stow my insulated carry-bag that I used to use for keeping photographic film cool in the field. In that went the frozen items, and those refrigerated things that don’t do so well after an hour’s exposure to hot air and sun, like eggs. Didn’t want any hatching upon my arrival home. I wanted 10 pounds of ice, but all they had was 20-pound bags at the same price. Half of it went into the bag just before loading. Whatever survived of the rest would go in the camper’s refrigerator, which is struggling in Wendover’s 90-96 degree heat. Adding room temperature items really plays havoc with it for a full day afterward. Anyway, all the stuff made quite a vertical pile, but the elastic cargo netting I’d gotten did contain it all nicely. I guessed I might have at least 50 pounds jammed in there. The Ibex’s Greenfield kickstand really saved the day here since, once fully loaded, the Aurora’s kickstand didn’t stand a chance. This thing wanted to turn turtle in the worst way, and the Greenfield put a blunt stop to it. The Ibex has three spring settings on its rear wheel, and I tried to move it to the medium setting, but it wouldn’t budge. I lifted the load off, but it still hung up. Hmmm, needs a little lubing and “persuasion” back home to get it to play nice. B.O.B. cautions against bottoming out the suspension, so I noted how much of the available movement was taken up by the static load, how much was left, and what I’d be going over on the way back. Check. Its current 25-pound load setting would probably survive just fine. I strapped the remaining ice on top of the Aurora’s battery pack, and rolled out. Holy crapola, this assembly had a life of its own! If I didn’t breathe, pedal or steer, it was okay. Heavy, but okay. But correct for balance, tilt over slightly in the action of pedaling, change direction, or even correct for a pebble ticking the front wheel a little off to the side, and it was exiting times. Maximum deviation was half a lane. All that weight and its height was causing a lot of structural flexing from side to side. Some was in the trailer itself, and I suspect some was in the Aurora’s thick but unsupported rear frame stays, causing the bike’s rear wheel to steer a little on its own. Needless to say, the trip home was a dance of precision. Go much below 7 MPH, and the wobbling load at that speed required steering corrections to maintain balance, which was a no-no. Let it coast above 13 MPH downhill, and the flexing motions became increasingly hard to control. Pedaling had to be passive, as non-energetic as possible, or the small side motions of the bike would cause the load to wobble almost out of control. Sheesh! I considered myself lucky that I didn’t dump it. So, I managed to keep it at around 11 MPH the whole way. For it’s part otherwise, the Aurora’s drivetrain dealt easily with the load, including a steep local overpass over I-80, taken without pedaling. And at the end of the 18-mile round trip, battery depletion was minimal, barely registering on the meter. Once back at camp, I broke out the electronic bathroom scale and found that I had a documentable 80 pounds onboard, plus what I’m estimating as 20 pounds of additional groceries that the scale wouldn’t accept. The trailer’s absolute maximum rated load is 70 pounds, and here I was popping around 100. No wonder I was having a wee spot of trouble! I made a mental note to: 1) remember the basket next time, and 2) not load up on heavy items just because they’re On Sale! But hey, I made it, and I’m eating well! Still enjoying your posts Doug – keep it up! Oh, and I did promise to report on the big battery usage. In speed mode, quite a few hills and 15 ish miles round trip, lost 1 bar on the gauge. I do coast a bit with the throttle here and there too 🙂 Note, in speed mode I have seen the gauge read over 800 watts. Thanks, Eric! I always think, “Gee, I hope that’s okay” whenever I watch watts pop up that high, but the motor seems perfectly okay with it even on a long grind uphill. I’m sure some electrical engineer would yawn and nod. Lol. Now why is it, that when you get into trouble, your tales are just so much fun to read! Thanks! Maybe because they are written in hindsight, which is a whole lot better than still being in the situation! Plus, it’s easier for bungling mistakes to be amusing when they end well. It’s either that, or you just like seeing me get into trouble! Well, wobbling down the road while whimpering is not the same as getting hit by a locomotive. The happy ending was a big glass of soda with lots of ice, and a sofa. And quieter whimpering. Hi Doug. Maybe a trailer with 2 wheels. Just a suggestion. Too late to change horses now, Dave. My suggestion to myself is to not overload the thing by 30% and expect it to still work as intended. Over time, I’ll get a better chance to learn how the rig behaves at various legit loadings. Actually, I’ve picked my way through numerous ground obstacles so far, that would have posed a problem with a two-wheel trailer. Threading through inline was an easy miss, and I’m likin’ it so far. Ron, I’m thinkin’ add a full fairing, add another battery pack and double the voltage from 48 to 96, swap for taller gearing, replace the main wiring with 4-gage cable… and add a basket underneath to catch all the parts when they fly off. Don’t discount a V-8. Remember that Toyota you saw in town? holy crapola, you are a funny guy…I can understand the fine wine…but coke? I would have loved to see this ride…. It was Coke Classic, much like myself. I almost had a couple of YouTube moments on the way back! Based on when we used to hand carry groceries home from the store it will only take you a couple of trips to learn what to buy and how to pack it. Then we will have fewer fun stories, though, so you have my permission to increase your learning curve. I’m just lucky that I didn’t break any eggs or (badly) bruise any bananas. And that glass jug of wine was a priority, of course. Here’s to less exciting grocery shopping in the future. My experience with this is that it’s less due to load and more due to the *height* of the load. I’ve had about 100 lbs in mine without trouble, but 70-80 lbs of load stacked high can be a big problem. My advice is to do everything you can to keep the heavy stuff as low and forward as possible and that will help quite a bit with the weaving. Also, make sure the tire is pumped up as much as possible, and if the suspension has an adjustment, make sure it’s set for the firmest point. Glad you’re enjoying the new Aurora – we’re following your adventures closely here at EVELO! Interesting, Dave. Nobody ever mentioned that the “instability” is essentially the effect of chassis flex (in twist) magnified by speed rather than perhaps some mystery problem with with pivot geometry. Thanks for the advice, because most of the heaviest items in this case were rearward at bottom, to try to prevent their slow slide down the floorpan that might put the squeeze on more fragile things as the ride progressed. What it pointed out to me at the time was the huge effect that much weight can have on balance as it momentarily rotates sideways just a fraction of an inch, its “roll center” or pivot point being the tire contact patch on the ground. With the chassis resembling a large spring, the more abruptly you have to correct, the more energy is fed into the spring for the next wobble! And I’m with you on the tire pressure, as its weight capacity is limited, and they do occasionally fail as a result, it seems. My hope is that the suspension helps limit the shock it receives. Thanks for your input on all of this. While it’s kinda spooky that “the manufacturer” is reading whatever I post about my e-bike rig, it’s also rewarding and points out your interest in what’s posted online about Evelo products and how customers are using (or abusing) them. In this case, I have some decent opportunities close ahead to really wring out a “commuter bike”, as it’s pressed into hard service at remote locations. I hope you will find them interesting to read. It Hurts So Good Dept. Please click on the EVELO image below to review all of the models and options available to you. And, you can enter the code "StrollingAmok" for a $100 discount off list price on any Evelo model. I'm an active Evelo owner, and I personally endorse their e-bike line. Should you purchase any model using the link below, Evelo will send me a referral fee at no additional cost to you. Overnight RV Parking Undoubtedly the most useful source for finding short-term RV parking. Wheeling It A very well-rounded, informative blog about full-timing with way too many fur-bearin’ critters in a big intergalactic cruiser. Calyptura Would you leave your job to go birding across ALL of Latin America for 3 years? This couple did. Drunk Cyclist A bicycling blog with numerous contributors, each exploring the fringes of sanity. Sunset Boulevard A cinema blog featuring just about the most interesting and insightful views of various films. Far from your typical shallow action movie fansite. Two Happy Campers A well-written, informative and beautious blog well worth returning to. The Landmarks Mr. & Mrs. Landmark plus Junior Landmark on tour, full time. A very entertaining site! Life with Aspergers This blog describes what it is like living with Asperger’s Syndrome, and to focus on the positive aspects of the condition. The Feral Blog As their description states, “We done dropped out,” but not out of an insightful and amusing view of life on the road. Mallory Paige The young lady, the dog, the motorcycle with sidecar, the road atlas, and the why. Travels of a Rambling Van A retiree, his Sportsmobile Sprinter van, and his craving for the better class of tourist traps. Mr. Money Mustache The Joys of Hard-Core Cheapskatism.